I recently purchased my first Miles Kimball goose! I love the Miles Kimball white goose. I wanted to have a fun decor item that could be used all year round as the seasons and holidays change. The outfits are nice quality and there are a ton to choose from. Next on my list is to get a second one so I can start using the boy and girl coordinating outfits. 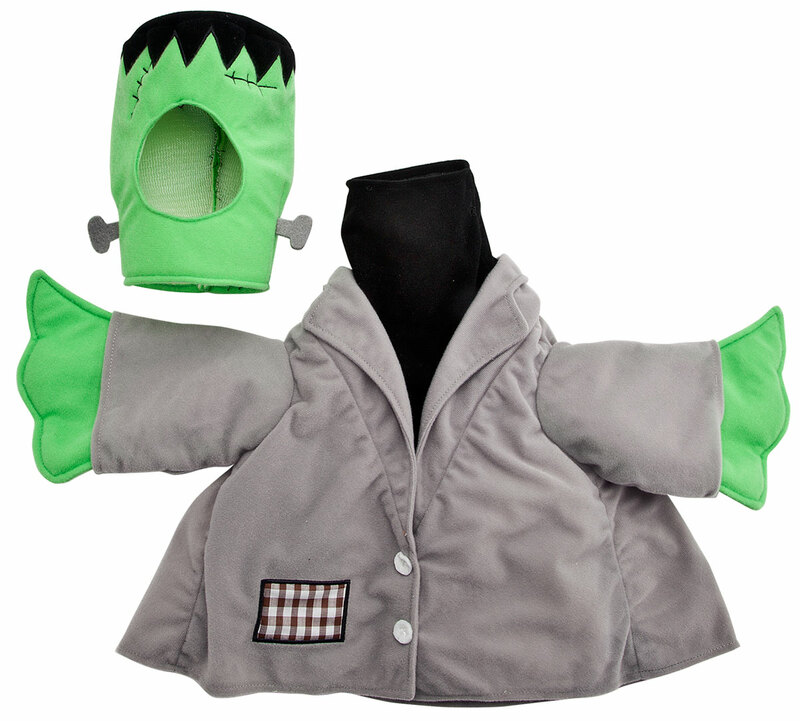 Great goose with exceptional wardrobe available children love him when he is Frankenstein. Had been looking for one for ages! Recipient loved it. Be careful to read reviews of clothing...apparently there are two sizes of geese, this one being the larger. Frankenstein costume fit perfectly. My goose is out side dressed for Christmas,every body likes it. I love these geese all dressed up for the holidays. The only down side is they are so light weight and their outfits are definitely not for all weather. 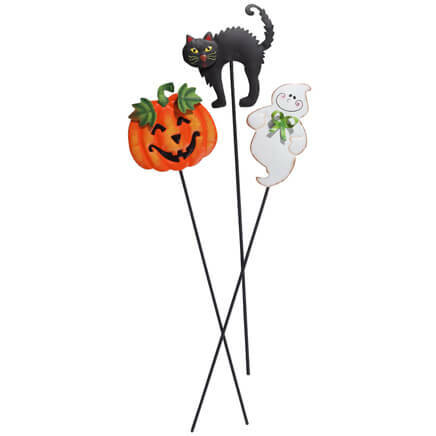 I have two and I am going to use them on the steps or deck to decorate. Very nice with their little outfits on. I'm giving the goose as a birthday gift to my friend in Aug. She is a Greenbay Packer fan and found a football costume to outfit her goose and am sure she will love it. I had looked everywhere for a goose and none of the local hardware stores had anything even close to what the real goose looked like. Glad you had one in stock. Thanks. I love the whimpsy of the goose, I like to dress them in all thew different outfits. My neighbors will comment on what the goose is wearing, it is fun. Im so loving my ducks!! They look really nice sitting on porch!! This goose is very lightweight. It looks adorable in the elf outfit I bought. I bought it as a gift, and it was hard to give away! We really love the goose. The only thing that we didn't like was the clothing we ordered for them. The clothing are made way too small and will not fit on the goose. So buy the goose but don't buy any of the clothing. I just love these geese! I bought two of these and some of the seasonal clothes to put on them. They are the cutest decoration inside and out. I have mine on either side of my front doorway for all to see when they pass by. And I love that you can put holiday clothes on them with each seasons. I know am thinking about getting another set for my mother. She will love them. Thanks Miles Kimball. Great decoration for my yard. I have him out for Christmas in Santa suit plan to outfit him for all holidays. I would definately buy this goose again! This goose and her clothes are just too adorable. My 4 year old loves to dress her up all the time with all the very excellent quality clothes and head pieces. I will be dressing the two geese (male and female) for the different holidays throughout the year. I plan to make them hats and scarves for winter. I also plan on getting other costumes from Miles Kimball as I can for other holidays. This goose is a showpiece. This goose is so large it makes its own statement. Everyone comments on how cute it is. I use this product in the house to repesent what my kids are doing in their lives. It is perfect to use all year round. It looks great on the porch. I keep my geese out year long. Snow, heat they are still in great condition. I live all the outfits it's fun and the kids and adults get a kick out of them. We have even named them! On front pourch and pool area for parties and holidays. I have two of the Geese in my front yard landscaping. I change their outfits every month to go with the holiday or season. I know all the neighbors enjoy seeing them. My grandson was so happy with this and the outfit I bought for the goose. It is a nice large goose, nicely colored. It is super light weight and has a good plug on the underside to add sand or rocks to weigh it down. All the clothing fits perfectly and it adds cute "curb appeal" to my property. People walking by like to see what clothing she will be wearing. Goose is cute to use indoors or weighted down for outdoors. It is light enough to move around so can be used in various locations. Darling goose. I can't wait to put her out in the snow. 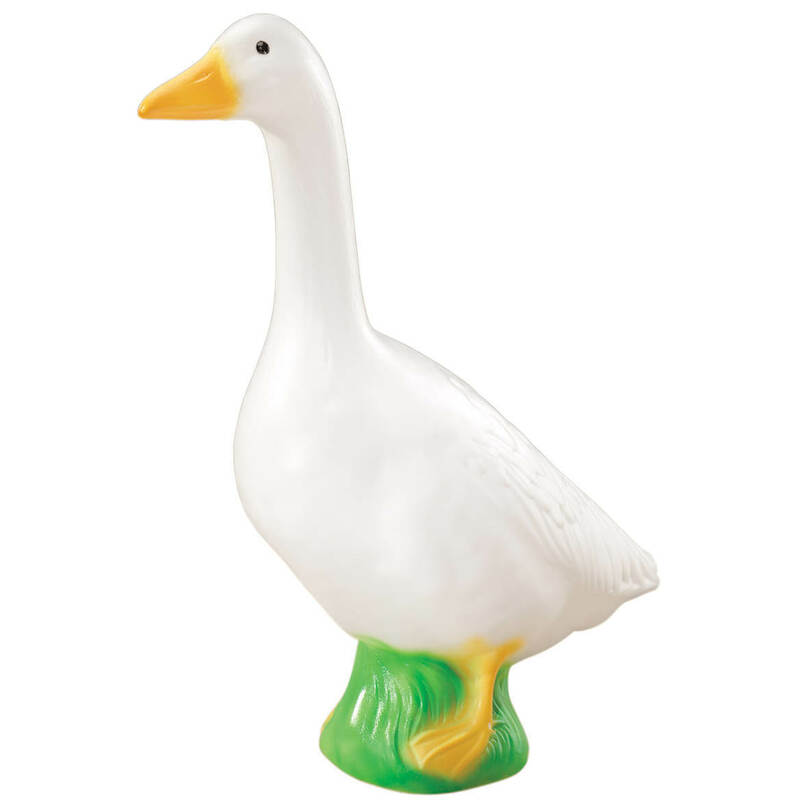 These geese are a whimsical way to decorate all through the year as costumes are available for virtually every occasion. 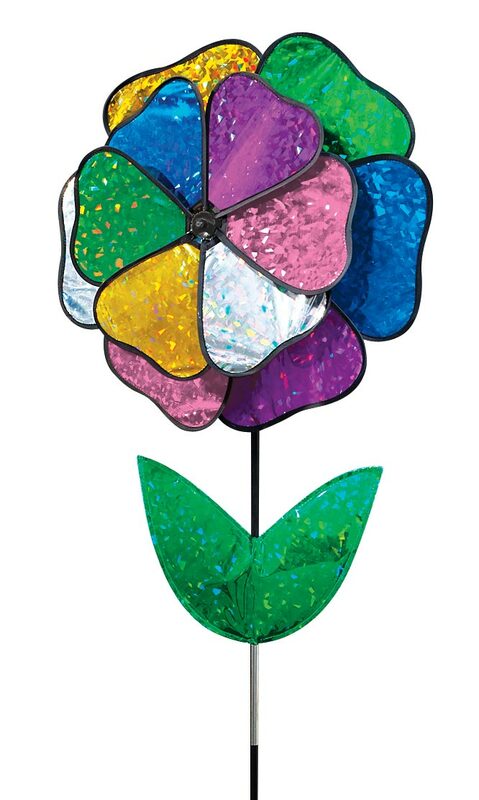 They are an entertaining addition to the porch and always provide a cheerful greeting to visitors. Memories when we are gone.. This is our second goose that we bought our grown daughter . She has Mrs Santa outfit.. She needed a Mr Santa, so we bought a second outfit for Mr goose. She loves it.. Just a fun item in her house...Lasting memories from her parents... Our daughter is married and has 3 children! These are the cutest geese ever I bought 2 and I use them in the house to decorate for the up coming holiday they have outfits for every holiday! I really enjoy them and so does my mom whom I bought them for. My family of geese live in my front yard year round & dress according to the holiday or season. The geese have lasted years in the weather. my daughter's are crocheting cloths for the large white goose. i like to get a few more so i can have a family of these items. there so cute. i want to get the jr goose now. This was a gift, and has proven to be very popular. A few days after receiving it, my friend's mom passed away. Well, he didn't want to be alone on the drive home, so Sebastian went with him. Everywhere. Even the bar. Somehow this simple gift has given my friend some happiness in a difficult time. So adorable this outdoor Goose is a perfect lawn decoration. Full with sand and it stands with out any problems. Love it! I love to dress my goose according to different occasions that occur; for example, Halloween. Spring , Fourth of July, Flag Day. Birthdays. My house is not hard to dress at all. I just have to make sure I get the correct size. Like I have to do for myself, I don't have anything negative to say about my goose. Oh yes, I have fun! Delighted to find a lightweight goose (low shipping cost) Sprayed it with Rustoleum's clear spray to protect from deterioration... Filled it with glass marbles(windproof). So darling in it's seasonal outsfilts!! You have the only goose with costumes I could find. I like the selection of costumes. It will be fun dressing up my goose! The last one got destroyed. Replacement. We dress it every month and have it as a traveling good award for good job. Want to add the goose and all its outfits to our yard during the holidays and seasons. Will be ordering another one to be able to display both his and her outfits.Love them! We own one already. Buying this for friends. Our kids like dressing it up and it is always so festive. Wanted the goose and outfits for years. Finally decided to buy and enjoy throughout the year. My girls wanted to dress up a goose for Easter--so I said why not? You were the only company to have this item for sale. I want a Goose to dress myself!!!! I saw them on like 50 people's properties and searched everywhere until I found this website! Perfect by itself, or you can dress it up for each occassion. Our neighbor puts these geese out every holiday and it delights all passers-by. My mother is trying to replace some plastic lawn geese from the '80's and this is the closest I can get! we've wanted these forever- happy to finally find them at a good price! I picked this goose because I can't find mine and I finally found this one that looks like him and will fit my Goose Clothes. This is the second goose I have purchased so I can have two for each occasion. The goose will be fun to decorate for the holidays and I love to decorate especially Halloween and Christmas.. I have one and outfits need another one. love to dress these. My daughter-in-law is in LOVE with these geese and adorable outfits! Early Christmas shopping for her = more time for me during the busy holiday shopping season! We have the original Union Products goose and the two sizes of the Drainage Industries Goose that Miles Kimble sold in the past and decided to add this one to our collection also. I have two concrete ones the same height outside that I dress. I bought this one to keep inside to try the clothes one while making them instead of having to run outside to see if it will fit then bringing it back in to finish. It will save me a lot of steps and time. Thank you. Also it is light enough I can move it to where I need to without much trouble. Always wanted a larger goose. 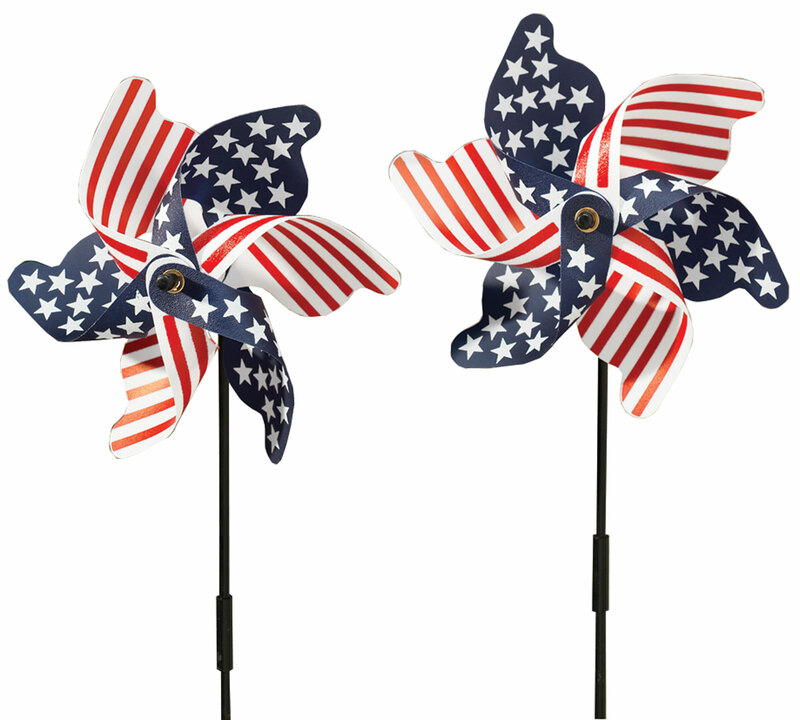 I bought this to have something different to display holidays instead of a flag or wreath. My wife originally found this while looking thru magazine and thought it would be a great addition to our yard and besides nobody else has one. I hope dealing with this company proves to be a good choice. everybody loves this goose my grown kids say mom i need one please so this is number 4 i make all its outfits. and they love them. I love geese of all kind. 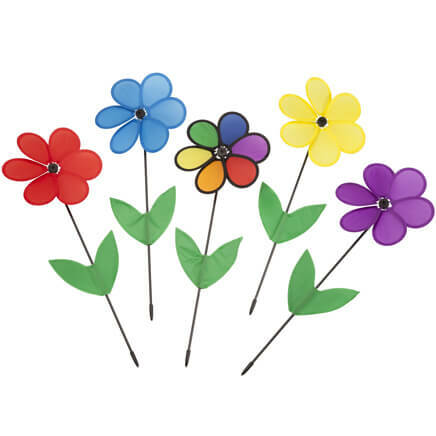 I thought these would look nice in the flower garen in my front yard. how can I get a junior goose? BEST ANSWER: Thank you for your question. Unfortunately, we no longer offer the junior size goose. We apologize for any inconvenience this may have caused. Then why do you still run ads for Jr outfits which I received instead of large outfits if you don't sell the small goose? do junior goose outfits fit the large goose? BEST ANSWER: Thank you for your question. No, junior goose outfits will not fit on the large goose, they will only fit on a junior goose. We hope this information will be of help to you. How tall is the goose? BEST ANSWER: Thank you for your question. The goose is 23" tall. We hope this information will be of help to you. Is there a goose club? Since this is plastic will it blow away with wind? BEST ANSWER: Thank you for your question. There is a hole in the bottom so that you can fill it with sand to weigh it down. We hope this information will be of help to you. do have valentine's day outfits for geese? BEST ANSWER: Thank you for your question. Unfortunately we do not have Valentine's outfits for the goose. We hope this information will be of help to you. do you have goose outfits for Valentine's? BEST ANSWER: yes goose is hollow. watch for neck when lifting it comes out easy so do not pick it up by neck use body. Yes, the goose is hollow. 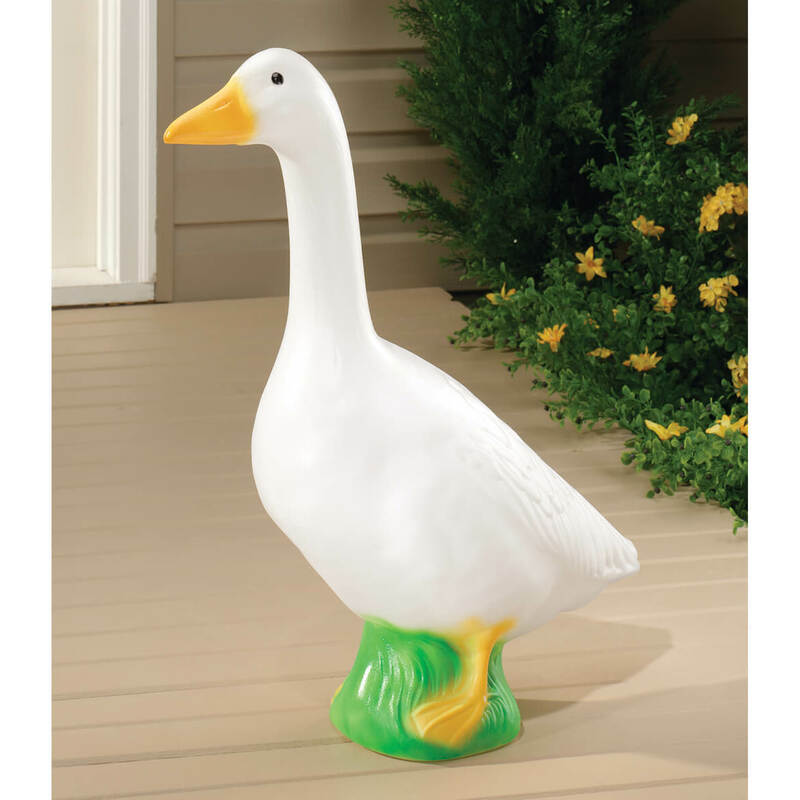 I have purchased several of these geese which are displayed on my porch. There is a plug in the reverse side of the feet/pedestal. Take out the plug and put a few scoops of sand to give the goose some weight so it won't blow over. Or, you can also use cat litter to give the goose some weight. My neighbor did that and that works well, also. Yes, it is hollow. There is a hole on the bottom that comes with a little cap. I put sand in the goose to weigh it down. Works like a charm. yes the goose is hollow. Will it stand up to harsh winter weather? BEST ANSWER: Mine have been outside on my front steps for years. Just weight them down by putting sand or gravel inside. They have not even faded. Thank you for your question. Yes, the goose is very durable. We hope this information will be of help to you. We keep ours on the porch or in the house. We Luce in the south so I can't say. Not that I am aware of. I wish they would make more clothes for the goose. Don't have a clue. Did you check it out on google? Will it stand up indoors without sand while wearing an outfit? BEST ANSWER: Yes won't be a problem for indoor. I have 2 of them and they are always wearing an outfit, they stand up fine on their own indoors. If outdoors then may need some support depending on where they are just mainly due to the wind. BEST ANSWER: Thank you for your question. Unfortunately no the goose does not light up. We hope this information will be of help to you. Would your clothes fit a cement goose? BEST ANSWER: Thank you for your question. Our outfits fit a 23" tall goose. We hope this information will be of help to you. BEST ANSWER: Thank you for your question. The goose is 23" high, 7" wide and 16.5" deep. We hope this information will be of help to you. your pictures show a St. Patricks Day outfit, but not one to order. Do you carry St. Patricks outfits for the goose?